When I was a child, it bugged me every time someone asked me, "What are you?" meaning "What religion do you follow?" That wasn't because I didn't want to be asked. It bugged me even more, when they just assumed I was Christian like 95 percent of everyone in the community around us. It bugged be because I had no words for it. I grew up in a time and place where earth-centered spirituality was kept under wraps and publicly admitting it could very well lead to employment problems and/or an investigation by Child Protective Services. It was probably a good thing that I had no words for the little rituals, rune drawing, Tarot cards and quarter calling that I participated in with my mother's circle. And I survived the quiet longing for something more openly stated pretty well. But today most Neopagans have no such external restraints on giving our children a spiritual identity. Instead we are caught in the dilemma of whether and how much to hand our kids the ready-made Pagan identity. This goes beyond the concern that some adult Pagan events don't or can't reasonably include children. There are plenty of ways a child can be involved in earth-centered or even specific Neopagan practice. The feasts of the Wheel of the Year provide plenty of kid-friendly fun, inspiration and tradition, even if that is all a child is exposed to. But many earth-centered parents have either seen friends undergo or undergone themselves the forcing of a religious identity in childhood. The major religions today, other than Paganism, insist that children born within them should be held to them. Many Pagans who weren't born into an earth-centered path are Pagans specifically because they fled the oppressive atmosphere of religions that force an identity and practice on children. So naturally we don't want to become just as bad as what so many of us struggled to free ourselves from. And the issue of how much to develop family-centered traditions permeates Pagan parenting discussions. In my family, that dilemma intersects with another long-standing controversy in Neopaganism--the issue of ethnic identity. There are many mixed-race families in Paganism today. I've run into Norse-tradition Heathens who are half-Scandinavian and half-African but naturally to Europeans look more African than Scandinavian. There are Irish-East Indians. a great many people with mixed European and Native American background and many Pagans whose ancestry is all over the map. And in my family and several others, there is the issue of inter-ethnic adoption. Life takes us down unexpected paths and ours led my husband and I to adopt two children who happen to be of a different ethnicity. They are Romani (ethnic Gypsies) and as such there is some debate over whether or not they qualify as ethnic Europeans, since their ancestors came to Europe from India somewhat more recently than most Europeans. This type of thing isn't a controversy because we believe that one must follow the Pagan tradition of one's genetic ancestors. There have certainly been plenty of non-Celtic Wiccans while other Wiccans claimed some connection between Wicca and ancient Celtic traditions. But it is uncommon to find a Slavic reconstructionist Pagan who doesn't have at least some Slavic genetic background. And when it comes to children, it is particularly important to honor their own unique genetic heritage. It's an unarguable fact that most earth-centered traditions share a deep connection with ancestors and the land on which ancestors lived. Certainly we can and do honor ancestors connected to us by our tradition, craft or beliefs as well as those of blood and nation. But it is hard to entirely ignore the issue without some doubts of authenticity creeping in. There is very little scholarly work to be found documenting original Romani spirituality. There are always rumors and plenty of people who will claim their Romani grandmother passed great Pagan spiritual traditions down to them. But Romani people still living in the Romani communities today usually vehemently deny much of what these revelations claim. While the Roma as a people have held on to their language and culture far more fiercely than most other small, landless ethnic groups, they are chameleons when it comes to religion. Wherever Romani communities are found today, they match the religion of the majority society. In Muslim areas, they are Muslim. in Catholic areas they are Catholic and in Orthodox areas they are Orthodox. Whatever is left of their original spiritual traditions is well buried. And so I not only stand in the usual dilemma of most Pagan parents today, but also on an ethnic divide, where one side is almost entirely unavailable. I feel a strong connection to the ancestors and spirit of the Central European landscape where I now live and to Celtic traditions. But neither of those seems to have much to do with my children. My altar carries ancestral symbols for everyone in our household--Celtic, Norse, Romani and Slavic. And when I honor ancestors of blood, I honor them all. But I am hesitant to tell my children what they should be. I tell them they are Romani and teach them to be proud and not to hide it. I tell them their citizenship in two countries. I tell them about Romani ancestry and about mine and that of my husband. I tell them that the spiritual traditions we practice are sometimes called Pagan. But there is a line where I stop. I don't tell my children they should call themselves Pagan. I have pointed out when someone identifies as Christian or Pagan or Muslim, explaining what it means to identify yourself that way. But I leave their own identity open to them with enough words and experience imparted that when they do want to choose i hope they will know something about what they are choosing. So far, my nine-year-old daughter wants nothing to do with spirituality. She refuses to enter churches and avoids my altars and Tarot cards, and she always has. My seven-year-old son, on the other hand, often asks to light a candle on the altar, colors pictures from Pooka Pages, asks to draw a Tarot card, spontaneously says a Pagan morning prayer sometimes and requests Pagan songs for his piano lessons. These are all things he is exposed to because of adults around him. This is the wavering line I've decided to walk in parenting between too mysterious an identity and forced identity. We read myths and other stories from a Pagan worldview. I have even authored several Pagan children's books, illustrated by the children's grandmother. I don't hide my rituals or altars and I sing a short blessing song before important meals (though not before all meals). We occasionally meet up with another Pagan family with young children for holidays. We celebrate the eight holidays of the Wheel of the Year as a family with specific earth-centered traditions. My husband enjoys the traditions and the focus on nature but isn't particularly spiritually inclined. So some of the holidays aren't overtly spiritual. It's just what we do and it adds a pleasant, natural rhythm to the year. There are many different paths to walk in Pagan parenting and it is beyond my station to say what is right or wrong in it. The Shanna books (Shanna and the Raven, Shanna and the Pentacle and Shanna and the Water Fairy) portray a single-parent household that is somewhat more overtly Pagan than mine. The children in the story are older than my kids and have a more developed sense of their identity. But much of the conversation and holiday traditions practiced by the fictional family of the story is similar to what our family and many others do. The second book, Shanna and the Pentacle, weaves a story around the issues of identity that kids in middle childhood often face. In this spring-equinox themed story, eleven-year-old Shanna has to consciously acknowledge what her pentacle necklace means, though she previously thought of it mainly as a gift from a friend. And she has to learn to stand up for herself in the face of pressure in a society where Pagans aren't the majority. The story is one that is close to home for most kids in Pagan families and Shanna's adventures along the way prepare her to make her own decisions about identity. I wrote that story and the others as part of my quest to find the right balance of information, experience and freedom of choice for my kids. My parenting is a work in progress and I love to hear from other parents dealing with related issues. Please leave comments below if you are inspired. How do you approach passing on your values and beliefs to your children? Is your family mixed? How do you approach holidays with extended family that may have different traditions? What is the hardest part of parenting children in an earth-centered spiritual tradition? What's the easiest or most fun part? I look forward to reading your experiences. We respect youWatch this space for instructions on how to get your free book!r privacy. To get your free book go to my contact page here and send me an email. Include your email address, your preferred format (Kindle or Epub) and your choice of either the fantasy thriller The Soul and the Seed or the children’s book Shanna and the Raven. If you have always wanted to be more in touch with nature or attuned to natural cycles, the new moon is the time to take a step toward it. For me the first step on a new path is often reading books. It isn't just a passive, relatively easy step without a lot of commitment. I follow through on what I read. Several years ago, I started reading about moon phases, signs and cycles on a new moon. Now I've come through most of a year, focusing my daily spiritual practice and much of my household activities on attuning to the moon's cycles. The result isn't some sort of higher plane of existence, but rather a comfortable routine that feels grounded, healthy and now so utterly natural that I am surprised to realize that it has only been a year. Here are some books I recommend for learning why and how to synchronize yourself to the moon and use the energies of the moon for well-being. This is a complete guide for those just beginning on this quest. A new title from Moon Books, Moon Magic is a modern witch's exploration of everything moon related. It's nominally multicultural, providing the names and symbols of deities from around the world, but the rituals and visualizations all have a modern, Wiccan-inspired atmosphere. All the deities hug you, for instance. Still this is a good introductory reference, including helpful lists of monthly moon names, rituals and visualizations for each moon phase and the Celtic tree calendar. One of the less common and most helpful things in this book are correspondences of positive and negative symbols, herbs, colors and incense for each astrological moon sign. The book is well-written and concise. There isn't a lot of fluff or talking you into reading further. Moon Magic is a good reference for beginners with the caveat that there is a bias toward modern, European witchcraft and the multicultural aspect is token. I have searched for just the right moon calendar in the English language for years, and haven’t found it. Llewellyn’s is the best I can come up with. That’s primarily because I’m looking for both moon magic, astrology and a practical gardener’s almanac that is in tune with the moon as well. I would particularly like a Pagan-oriented moon calendar with references to a wide variety of deities, beyond Middle Eastern and European. Yeah, I am a tough customer. I am also less interested in random women’s poetry, affirmations and artwork, which adorn so many moon calendars. Llewellyn’s Moon Sign Book has a lot to offer though. The weekly calendar section provides the dates and times of moon transits through astrological signs and phases in a less than ideal format but it can be made to work, extremely brief gardening pointers, a short quote, a practical simple living tip, a tiny black and white picture and three or four lines for notes. There follows a good, universal gardening-by-the-moon section, which explains the basic principles but doesn’t include specific daily gardening tips. There is an extensive planting table showing which sign and phase to plant a wide variety of vegetables, fruits and herbs as well as a separate companion planting table. Both are quite helpful, though I find calendars which simply give specific days in the right part of the year for planting the various types of plants require less astrological study to decode. For instance, the book also includes a Moon Void-of-Course table which shows days when planting is not advisable, despite the sign and phase. So planting by the moon with this book requires reference to several different tables and pages for each calculation of a day or time to plant a specific species. That said the book does include a nice table that lists specific dates in each month for a wide variety of activities from weaning children to laying wooden floors. If you’re able to plan activities in advance this is a wonderful addition. Monthly moon tables (including the daily sign, element, nature and phase) and aspectarian charts are included, which allow for more detailed calculations. There are special tables for egg setting, hunting/fishing and pest/weed eradication dates. Less helpfully, major portions of the book are devoted to US weather forecasts over large “zones” by moon phase and these, in my observations, bore less than usual correlation to reality. This could be due to climate change and not the publisher’s fault, though climate change was not mentioned or discussed and probably should have been. Another large section is devoted to a pan-sector business forecast that is both too broad to be effective and to focused on random details that did not in the end prove portentous this year at least. There is an energetic and relationship forecast that includes references to specific signs and this was moderately helpful or at least entertaining to read. Each year the book includes several essays in the back on interesting moon-related topics ranging from healing, the moon phase divisions of various cultures and specific agricultural techniques. These were interesting and decently well written. Herbs of the Sun, Moon and Planets provides a list of herbs specifically for attuning to the moon. More than that, it provides a detailed discussion of plants and herbs for the planets as well. This tightly packed book takes the reader beyond lists of herbs. It includes the chemical make-up, medicinal and magical uses as well as the history of a set of herbs for the sun, moon and five additional planets. This book, though best used as a technical reference rather than read straight through, is helpful in determining which herbs and plants are suitable as offerings or incense when an astrological connection is needed. The popular hearth-side email circle, which now has over 500 subscribers, provides interesting posts on practical herb lore, earth-centered spirituality, social inclusion and simple living. Now this newsletter-come-virtual-cup-of-tea will also help you take note of the phases of the moon. This past year I have synchronized a lot of my activities with the phases of the moon. It has helped me to not only increase my garden's productivity but also to become more closely attuned to the natural environment. It's a challenge though. Our calendars are not set up that way. In the beginning, you have to keep checking moon phases and be more conscious of routines to make it work on your own. That's why i wasn't successful in some of my attempts to do this in previous years. But this year I have done it and now that it is done it feels easy and natural to me. I can now pass this on to my readers. Instead of sending out the Hearth-side emails on Fridays. I will be posting in the twenty-four hours before the new moon and before the full moon, barring computer glitches. This will lessen the frenetic pace, ensure better quality reading and give you a heads up on the moon phases, which won't require any extra attention. New subscribers are welcome. You can subscribe via the form at the end of this post and unsubscribe automatically at any time. New subscribers also get to choose a free ebook. I wish you deep and refreshing rest as well as abundant energy for new beginnings in the morning. Take time to experience the season of summer, the sun, the wind and the dappled shade. I can't recall a time when the runes were not a part of my life. My mother has carried a little bag of clay bits engraved with runes on walks with her ever since I can remember. She'll stop at a bench overlooking an immense view of the Grande Ronde Valley and pull a rune out of the bag to contemplate. Never content with things as they have "always been done," I've read several books on runes to try to understand them at greater depth. 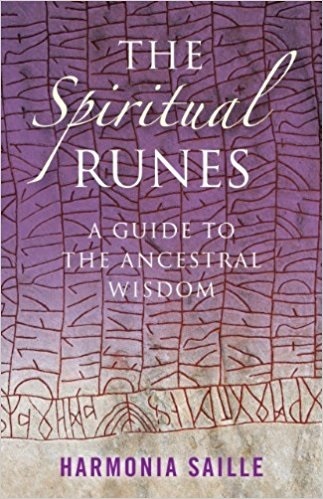 Most of these books discuss making rune scripts or bind-runes for the purposes of focusing intentions and bringing needed energies to a place or a specific issue. But mostly these books make only a token stab at substantial analysis of the spiritual basis for or history of the runes. That's why I leaped at the chance to review The Spiritual Runes by Harmonia Saille. Here is a book that claims to occupy the middle ground between the pocket how-to books that are accessible to all but seem to fall short on substance and the dense academic and primary source material. And it makes good on that claim. The Spiritual Runes is the first book I have encountered which provides solid historical information--including facts about the modern use and abuse of the runes--as well as rune interpretations for divination and very specific instructions for the use of runes in ritual and intention-based magic. Each section is complete and of suitable length and depth. No corners are cut and the tone is friendly and accessible at all points. The book goes into somewhat greater historical depth and provides more credible background for historical claims than most of my previous reading in commercial rune books. Still, the part where I found the book truly shines is the final section on rune rituals. This is mostly personal taste. I love the rituals suggested in this book. They are beautiful, simple enough to be practical and yet well-aligned for focusing intentions. I am sure to try several of them. Pagans and earth-centered people, even if you consider only those who celebrate Beltane, are wildly diverse in worldview, beliefs and lifestyle. We don't all teach our children the same things. It has often been said that there can be no Pagan politics, because we never agree on anything. Be that as it may, it is not difficult to see connections between earth-centered spirituality and the movement for social and environmental justice. If you have a strong spiritual path and you also feel strongly about protecting the earth, there is no doubt that these two parts of you will be intertwined. Likewise, spirituality and social/ethical values are interconnected for most people, whatever their spiritual path. We follow an earth-centered path because we resonate with a way of being that is concerned with interconnection, natural cycles and a sense of the divine in many parts of life. We are concerned about the environment for the same reasons - interconnection, natural cycles and a sense of sacredness in the natural world. Many also translate this into social justice. We are interconnected. Injustice anywhere is my business, because I'm part of the weaving. Natural cycles and the freedom to be close to nature is crucial. All beings have a part in the divine. Wildly diverse Pagans--just as people of other faiths--are going to translate these abstractions into concrete reality in all sorts of ways. But in the end, the point is that we cannot actually separate spirituality from social and environmental concerns. Beltane is a time when that connection is even more apparent. As the veil between the worlds thins, so does the separation between the spiritual and the social, the personal and the political. Beltane is most often associated with sexual energy and passion. It represents the vibrant maturing of the youth phase in most cycles, that stage in which energy is moving upward and outward. But it is difficult to ignore the other side of this coin of passion. There is love and sexual passion, yes. There is also the passion of the warrior. The Lovers card in the Tarot is followed immediately by The Chariot. And there's a reason for that. Beltane is the celebration of passionate union. It is also the celebration of unity in struggle. It is no coincidence that movements for social solidarity adopted May 1 early on as May Day. Like everything sacred throughout history, that connection has, of course, been used and abused by those seeking control and power. But that doesn't negate the foundation--the energetic connection. Earth day is also close by on April 22. When the body and spirit feel oppression within our human and non-human family or destruction of our home (the earth) happening all around us, warrior energy rises within us and demands a greater channel. This is a season when our warrior energy is demanding a release. In times of peace and tranquility that energy can be channeled into dance, love and other energetic, expressive pursuits. But when the body and spirit feel oppression within our human and non-human family or destruction of our home (the earth) happening all around us, warrior energy rises within us and demands a greater channel. In such dangerous times, the denial of warrior energy leads to predictable results: anger, fury, conflict and further destruction. Anyone who has been in close contact with teenagers (the human stage closest to the energy of Beltane) knows that sexual energy is powerful. Suppression and silence only lead to unhealthy results. That is why we give it expression in healthy ways, learning how to channel it. Warrior energy is the other side of that coin, the shadow in the spring sunshine. And its suppression is no more possible. Human society relied on literal warriors and hunters for the vast majority of our genetic history. In recent centuries, we have shifted our social organization from tribes to nations and tried to relegate warrior energy to defensive armies and law enforcement. I'm for peace as much as anyone, and I have huge respect for professional police officers and soldiers. Their channeling of warrior energy for the protection of all is part of what is needed. However, the warrior energy does not simply dry up in the rest of us--the civilians. Modern society attempts to suppress it for the sake of the status quo, but when we see and feel injustice, it erupts. If not given a legitimate outlet, that eruption is often self-destructive or harmful to others. This should not actually be nearly as much of a problem as it has become in our modern world. We try to force warrior energy to conform to sports competitions or try to drug it into submission with video games. But neither of these truly satisfies the need at a deep level. The most basic reason for this lack of release is that injustice and the destruction of our earth is all around us. And as long as there is such a threat, our warrior energy will not rest. Yet there is something constructive and positive that can satisfy it. Instead of suppression, professional armies, sports or video games, we need to recognize that the incarnation of the warrior today is the activist. 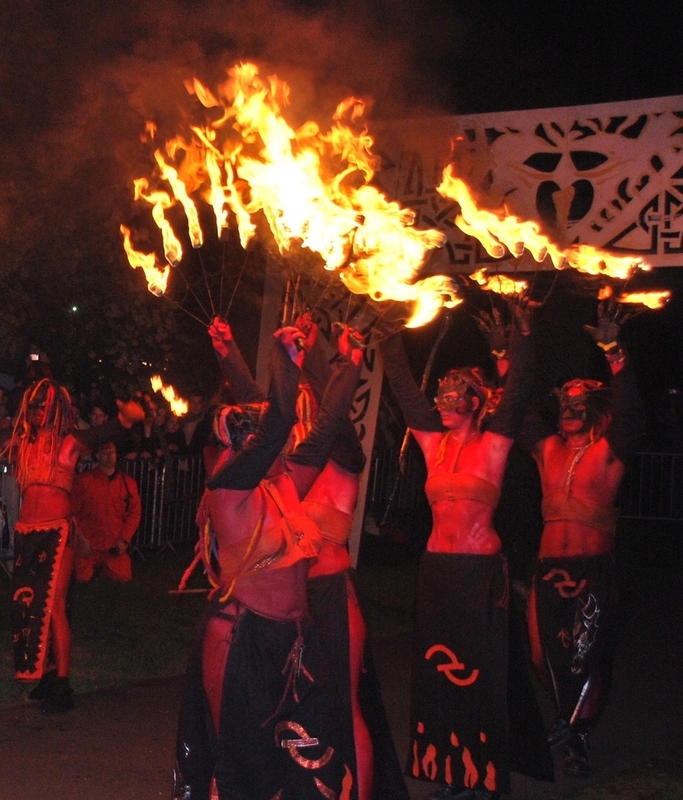 As such, Beltane is the natural celebration of activism and resistance to tyranny. In this year when much of our environmental and social fabric is threatened, the celebration holds particular meaning. You may not like the word "activist" because it has been used as a pejorative in recent years--to mean someone with a selfish agenda. But a person who is pursuing an agenda for profit is most often simply a business person. A person pursuing a profitable agenda for some other entity is just an employee. These are not activists, but rather people working at a job, whether you like their agenda or not. Calling anyone with an agenda an "activist" Is a trick of those seeking power to suppress the warrior energy of those they want to control. Activists, on the other hand, are in the most clear definition of the word not paid and not working for any specific personal gain. Instead their motivation is that of the warrior--protection of home and family, protection of the tribe, defense of the interconnected reality that allows the self to live and thrive. This is the other energy of Beltane, the shadow side. The opposite pole in the dance with the lover is not the hater. It is the warrior. Union is the natural partner of protection. In the past year, the brave people of Standing Rock helped other people all over the world realize the fundamental link between the ancient warrior and the modern activist. While there are activists of many types, fighting in defense of home, family and tribe in a myriad of ways, the activist most easily connected to the warrior tradition is the environmental activist. From Standing Rock campers to alternative energy innovators, from animal advocates to investors in rain forest reserves, earth warriors share the energy of Beltane. That is why for me this is a celebration of environmental activism and interconnection around the world as much as anything else. Now that I have children, this topic has become critical for me. I see them pulled--by peers, media and society--toward frittering their life force away with video games or allowing it to be suppressed. I realize the need to awaken that warrior energy for appropriate modern activism. I have been an earth warrior from an early age. I spoke up in defense of Greenpeace activists when a teacher at my conservative middle school denounced them. I wrote letters to the local newspaper when I was fourteen to protest clear-cut logging practices. I marched in anti-nuclear protests when I was much younger than that and protested the 1990 war in Iraq, at a time when few others did. 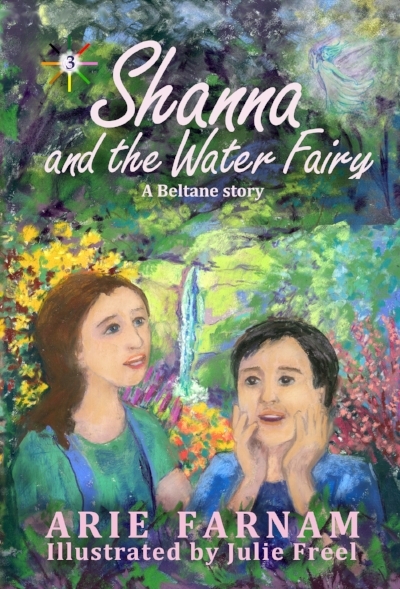 The book Shanna and the Water Fairy is children's fiction but its writing was informed by these experiences. I know from my own childhood that children often feel the pull of warrior energy. And if given access to information about the issues, they are often passionate earth warriors. This book is first and foremost a gripping story that kids love to read or hear read a loud, but it also has the capacity to give hope to the spirits of young earth warriors, who may be beginning to feel that the struggles are too big for them. Subscribe to get Arie's weekly "virtual cup of tea," links to new blog posts and a free ebook of your choice. No spam. You can unsubscribe any time and no one else gets your address. Reply to Arie’s emails and let her know which ebook you want. As a person interested in earth-centered spirituality, I've heard plenty of theories on dreams and dream interpretation. I've always been fascinated by the subject, but never committed to a paradigm. I've read both mystical and psychological texts on dreams, but didn't feel that the theories and interpretations made intuitive sense. Now finally there is a book for people like me--the practical and scientific-minded mystic. Nimue Brown's Pagan Dreaming: The Magic of Altered Consciousness is a non-traditional dream manual that not only makes sense, it is also a comfort to read. The tone is like sitting down to a cup of tea in a homey kitchen with a woman who takes no nonsense and puts on no airs. Brown's approach is dramatically different from the many dream dictionaries that claim that dreams speak to us in a universal symbolic language. Instead Brown argues that symbols are varied and--in our diverse world--likely to be individual in their language. This book is more about learning your own symbolic language of dreams than using someone else's. 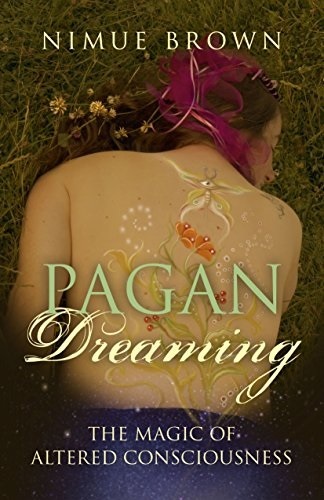 Pagan Dreaming presents both the physiological and brain chemistry side of dreaming as well as the processes by which giving dreams their rightful place in our lives can enrich a spiritual life. It's more of a manual of techniques and thinking than it is a dream interpretation book. And this sits well with me. The premise of the book is that most dreams, probably the vast majority of dreams, are ordinary processes of the body reflecting physical needs or sorting memory--essentially the "system check" mode of our bodies. And then there are a few dreams which may--and then really only subjectively--be considered to have emotional or spiritual meaning. This is the experience of most people. Many books have claimed that the more one can act coherently in dreams and choose the type of dreaming, the more spiritually aware and integrated the person. Many books have claimed that a truly spiritual or enlightened person should have prophetic or significant dreams. These books are likely to make those whose dreams are more like a"system check" feel inferior and perhaps ready to accept the wisdom of a supposedly enlightened teacher. Brown is selling none of that. Instead she gives a guide to learning about one's own dreams, empowering the individual to be their own teacher. As such, I did not find in this book the answer to questions I have about some rare bit eerily predictive dreams I have experienced since childhood. I did not learn how to turn my mundane dreams into more of the predictive kind. But I did gain some ideas and a structure in which to start looking for a greater understanding. Sometimes I am asked why I celebrate the Pagan Wheel of the Year with my family, even when there isn't a fun community event to attend. Why do you need special words for season celebrations? Why do you need to complicate the dates of school holidays for your kids? There isn't definitive proof of the ancient origins of celebrating eight solar holidays, so isn't it partly made up? As with most things connected to spirituality, there are several levels to my answer.. On the surface, the answer is simply that these celebrations ring true to me deep inside. And second, I want honesty in practice, I suppose. Growing up in an earth-centered family that didn't use the Wheel of the Year, calling our celebration "Christmas," while acknowledging that we were really celebrating the Winter Solstice, I always felt a disconnect. If we're "really" celebrating the winter solstice and we know historically that Jesus Christ probably wasn't born on December 25 and he isn't our main focus anyway, then why don't we just celebrate the Winter Solstice and cut out the middle man? I felt like kids in real Christian families had it better because they had a tradition, something meaningful in their celebration. And ours felt truncated, damaged... even, yes, stolen. This was not an intellectual thing. I was too young at the time to know the history but that was how I felt. And I wanted a sense of authenticity for my kids. That was essentially my motivation in the beginning for celebrating the Wheel of the Year. But lets's face it, it's a hard thing to keep up year after year--a holiday every six weeks or so, that begs for specific preparation, attention and connection. If it were only a matter of principle, I might not have lasted thirteen years and counting. Many people don't. What keeps me strong and passionate about celebrating the Wheel of the Year is it's practical usefulness. Yes, practical, real benefits. Let me explain. We all tend to get stuck at some point in our lives, either in depression or being a workaholic, being young and isolated form what isn't in our generation or being old and feeling like our life is over. There are many places to get stuck and those stuck places can last years. And that is a large cause of misery. The Wheel of the Year essentially ensures that I don't get stuck. The celebrations in are in alignment with nature and thus objectively "true" or "real." Even deep depression eventually has to at least acknowledge the fact that spring came again. And better yet, the Wheel of the Year is a spiritual teaching in a nutshell. Within it there is pretty much all you need to meditate on spiritually. Each celebration calls up specific important values and themes and taken all together they are a code of spiritual being. People sometimes ask how I teach my children about Pagan beliefs and rituals. The primary answer is that I celebrate the Wheel of the Year with them. There are other things, like learning herbcraft, grounding meditation, prayers of gratitude for food and a little simple candle magic, but mostly it's about the Wheel of the Year for my kids. The earth is our textbook and the Wheel of the Year is our lesson plan. It isn't just as simple as learning the cycles of the seasons though. Okay, sure, everything dies in the fall and is reborn in the spring here, but in some climates that isn't entirely true. That isn't really the point anyway. Each celebration has particular themes that feel connected to the earth and sun at that time and therefore are easily understood at that point in our journey around the sun. At Imbolc we go within and delve into dreams and intuition. It is the time in the belly, before the birth of new plans, activities and projects. At Litha (the summer solstice) we are full of life, bounty, energy, pride and expression. We are often hard at work and celebration comes amid many other activities. At Samhain, we are drawn back to the earth, there is a feeling of old sorrow, of things coming to necessary ends and a tendency toward memory. It is the natural time to be reminded to honor our ancestors. If you celebrate Imbolc, you will not go a whole year without remembering to focus on your inner world. If you celebrate Litha, you will not go a whole year without expressing yourself with energy and pride. If you celebrate Samhain, you will not go a whole year without honoring ancestors. And each celebration has a similarly crucial point. I will be writing more posts about the spirit of each celebration, but the celebration at hand is Ostara, so I'll start with that. Ostara is the European Pagan term for the spring equinox and it is celebrated much like Easter. The appropriate symbols are eggs, sprouting plants, rabbits, hares and babies of all kinds. The obvious themes are renewal, rebirth, the beginning of life and expression, new beginnings in general and children. As a mother, it is very important to me that my children have a lovely time at Ostara. It is a time to honor and delight in them. They are the future, our new beginning as a species. Their joy in the springtime is a blessed and righteous thing. So, more than any other time they get to eat a lot of candy. They fully enjoy scouring the yard and back woods for treats and eggs. We make pretty colorful crafts, many of them egg-related. But when I started to contemplate exactly how to convey the concept of rebirth and new beginnings to young children, I realized that the spirit of Ostara goes much deeper than that. If this is a celebration that also honors children, that necessarily implies the protection and valuing of that which is vulnerable. New life is inherently vulnerable and we can see that protection of vulnerability in all of the ancient symbols of this celebration--particularly the egg. We know that in our modern world the worst abuses of human rights are suffered by children. Children are more likely than adults to live in poverty or to be in need of basic necessities like food, water and shelter. Children are often the first to suffer when societal racism or other prejudices rear their ugly heads. There are obvious reasons why the protection of children is connected to human rights in general. The protection of new life extends, of course to the protection of the vulnerable among other species. The concept of both biological and cultural diversity is implied in the rainbow colors of Ostara. This is not only a celebration of one rebirth but of all the colors and miraculous diversity of life--human and otherwise. This realization has deepened my experience of Ostara. This celebration of renewal can be a great help in overcoming a stuck place in myself. If there is some lingering depression, hurt, resentment or stagnation, the return of light to our northern latitude does wonders for it. The necessity of getting outside and tending vigorously to the spring needs of our urban homestead is invaluable in getting past blocks. But more than that, the celebration of rebirth, color, diversity and the protection of the vulnerable is what the heart needs at such times. It is a shot of clear-eyed idealism., regardless of how bleak things may seem in the outside world. This year, many of us are exhausted from a long winter that did not seem to be as restful as it should have been. We have been struggling to retain the way of life we and our ancestors fought for--the rights and freedoms that often came at great cost. We are also contemplating that now when we should be working primarily for a sustainable future, environmental concerns have taken a back seat to the immediate needs of vulnerable people in our society. Plenty of us are already experiencing outrage fatigue. And it is just early days yet. And here is Ostara, the celebration of renewal, a time to warm your heart and think of fluffy and bright colored things. It may be hard to grasp when things are hard, but this is what we actually need right now. Stop a moment, ground yourself in the earth. Remember that the earth's rhythm does matter. Let the energy of renewal and new life flow into you. Focus your energies on protecting those most vulnerable, both human and non-human. Celebrate the rainbow of diversity in languages, cultures, colors and species. 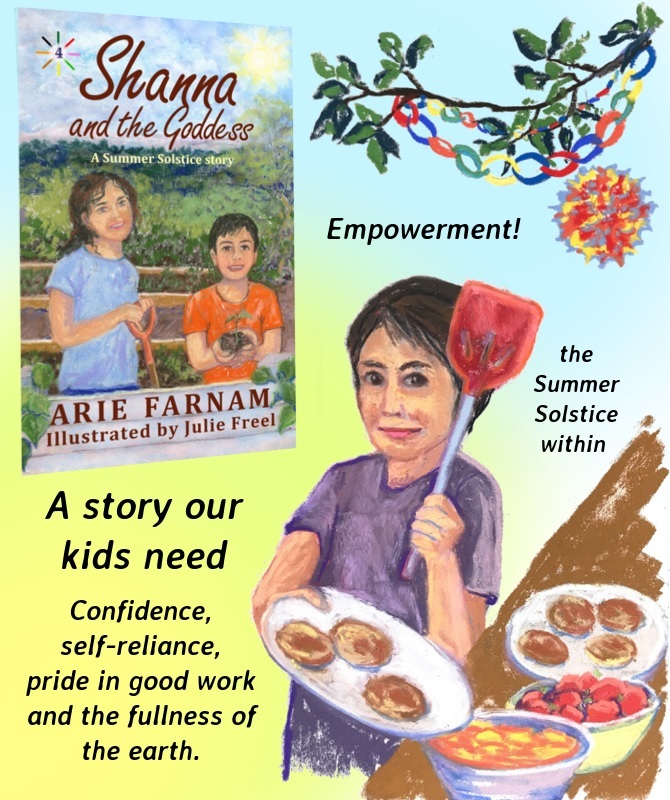 In my quest to teach my children these values of eternally resilient life and hope, I wrote the Ostara story Shanna and the Pentacle. This is a story for all earth-centered, goddess-oriented and vaguely Pagan families. It isn't a "teachy" book, but rather a story that grabs kids' attention, especially if they are growing up as a religious minority. In this story about new beginnings, eleven-year-old Shanna and her eight-year-old brother Rye move to a new school. At first, that seems like challenge enough. New beginnings are exciting but not always easy. Amid budding flowers and preparations for their Ostara celebration, Shanna runs into a real problem. Her teacher and some of the kids at her new school object to a pentacle necklace that her best friend gave her. When her family moved Shanna had to leave her best friend behind and that is part of the difficulty of this new beginning. When her teacher demands that Shanna stop wearing her pentacle to school and the principal confiscates it as a suspected "gang symbol," the young girl feels the sting of prejudice. Shanna is at the same time learning to accept others who are different from her. One of the new things about her new school is the greater cultural and racial diversity of this urban school over her previous one. Shanna soon discovers that friends come in many varieties and it is through a surprising friendship that Shanna gains the courage to stand up for her own identity as a Pagan girl. This story not only embodies the crucial messages of Ostara, but it is also filled with beautiful paintings by Julie Freel that evoke the season and the story. This is a story for Ostara, though one that will show that new beginnings aren't always easy. It emphasizes the importance of standing up for one's own identity, the great advantages of diversity and the need to protect the young and vulnerable. With this story, these values are not forced on children but delivered in a way that makes them as natural as the fact that the sun rises earlier every day in the spring. I hope you'll enjoy this story and share its fun and themes with children in your life. Many people have asked when there will be more stories in the Children's Wheel of the Year series and I am delighted to tell you that the Beltane book is very nearly ready to be printed and will be out well ahead of the holiday. 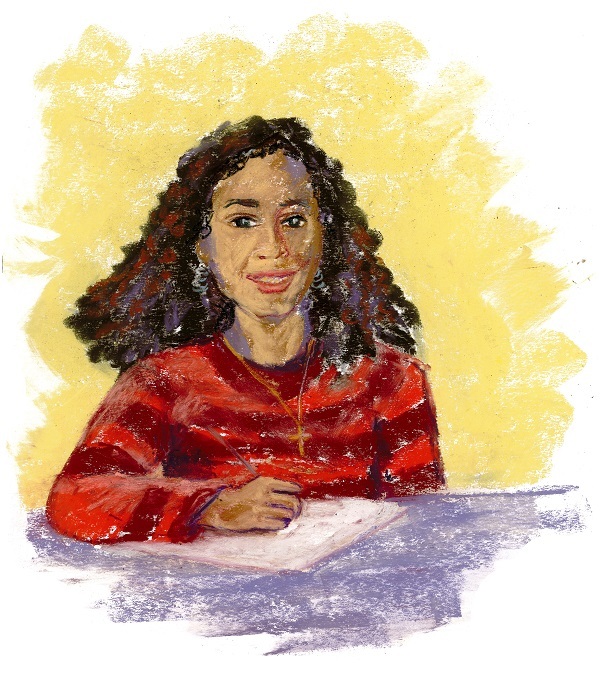 I hope you will support our endeavor--which is still non-profit due to the costs of the illustrations, materials and books--and share these stories with others. If you are eager for more stories about the natural themes and values of the Wheel of the Year, spreading the word about these stories is a significant help in our efforts to keep them coming. Happy reading and blessed Ostara to all! My eight-year-old daughter is not normally very excited about crafts and she tends to be impatient, so I was amazed and delighted by our success with this craft. We made Brigid dolls today--two of them because she decided to set up her own altar and wanted to make her own doll all by her self. The craft held her interest for several hours and came out really beautiful. 1. We took a square of white cloth and put a solid ball of cotton in the middle of it. You can use anything from crumpled paper to cloth scraps to a Styrofoam craft ball. You can also use a white paper handkerchief in place of a white cloth for a quick but less durable doll. 2. 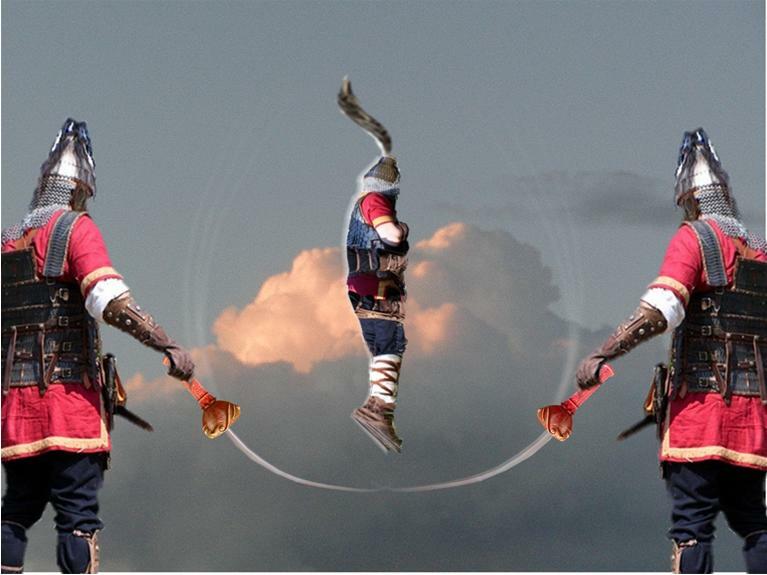 We then gathered the corners of the cloth and tied a red or gold string under the ball to form a kind of neck. We cut slits every few inches in the cloth, almost up to but not quite reaching the neck. 3. Then we rolled up another smaller rectangle of cloth and tied it at the ends to form arms. 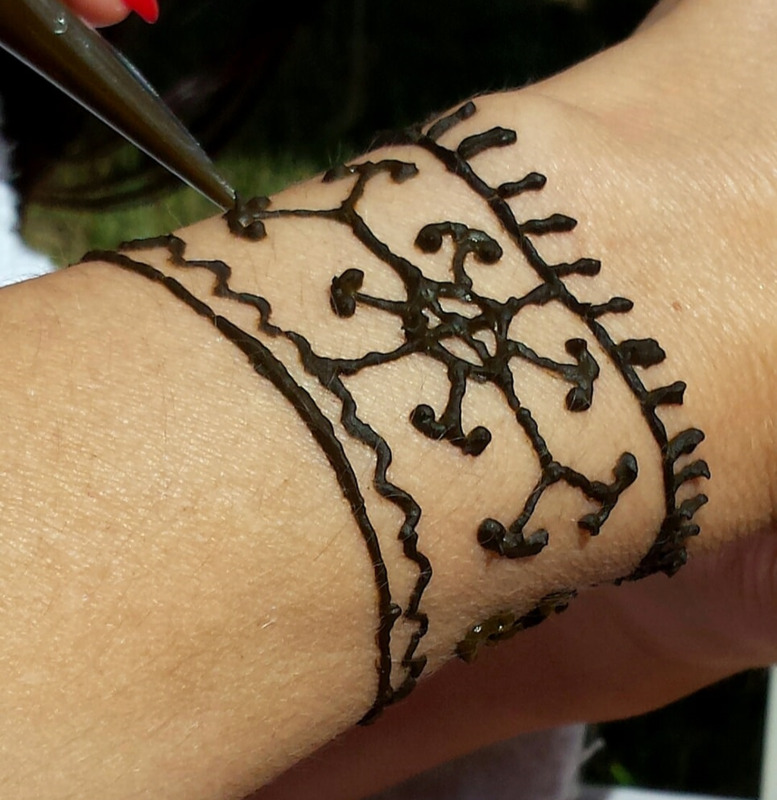 This we inserted under the neck through the slits, so that the arms protrude on both sides. (I also inserted a little extra cloth in min for breasts but my daughter didn't. You can see the difference in the photos below. 4. Then we inserted some dried lavender stalks from the bottom in place of legs. This makes the doll smell wonderful. You can substitute many different herbs or stalks of grain. Really anything symbolizing your last-year's harvest is symbolically appropriate. 5. We tied a second string around the middle under the arms, This serves as a waist and holds the herb stalks in place. 6. Now it was time to decorate the doll. First we put on hair. We loosely sewed embroidery floss into the head, letting each stitch dangle for several inches. This was by far the most difficult and time-consuming part of the craft and it could be avoided by coloring or gluing on wool, fabric or feathers in place of hair. But we loved the look of the embroidery floss. 7. We then tied and stitched a scarf or hair band on over the hair. This can also be done with hot glue. 8. Next we put on faces. My daughter chose to color hers on with markers and I embroidered mine on, although I am no expert at embroidery. Both turned out fine. 9. I added a lace apron to match the scarf, because I had a bit of extra curtain lace hanging around. Both can be made with any white cloth or even a white paper handkerchief. 10. Finally we used another red string to tie a few lavender sprigs into the hands so that they formed a welcoming circle in front of the doll. All ties were made with either red or gold strings. A Brigid doll should generally be white with red, gold and possibly purple highlights. This is the doll we will use in our Imbolc ritual. We will place the dolls in baskets by the hearth to sleep through the night before Imbolc. Then the children will come and light candles and symbolically wake up Brigid to bring in the spring in the morning. It is their favorite part of the Imbolc holiday. I'm so happy to finally share the making of the doll with my daughter too. By the way, this is the same craft used in the children's adventure story around Imbolc called Shanna and the Raven. Although in the book the craft is done with natural sticks or stalks of herbs for the arms as well. There is also a delicious recipe for white and red strawberry dumplings in the book. It's a story about how a couple of modern goddess-orriented kids celebrate the holiday and learn to use intuition for their own protection. I hope you will all have peace and inspiration this holiday. Blessings of creativity and warm hearths to all! Ice outside, fire within, the strokes of brush and quill, bitter steam of medicinal plants steeping in a pot--these things defy time. February 2, the day known to Christians as Candlemas and to modern pop culture as Ground Hog's Day was called Imbolc by the Celts of the British Isles. It is being called that again by earth-centered people all over the world. I grew up with many earth-centered holidays. I knew about the solstices and equinoxes. I even had some idea of the real meanings of Beltane. A harvest party in August or honoring ancestors at Halloween were also not entirely foreign concepts. But Imbolc was new to me twelve years ago when I adopted the modern Wheel of the Year consisting of eight earth-centered holidays. Here is a holiday entirely devoted to dreams, introspection, inspiration, intuition and creativity. It is like no other holiday because it can be easily celebrated alone and might even be best that way. I have come to love Imbolc. I feel like I am given permission to curl up with the Runes, Tarot and i-Ching in front of a cozy fire and dream without a schedule. I feel like I have permission to take a few days to do those quiet things I love, reading about herbal medicine (healing is a key aspect of Imbolc), creating something beautiful (art and creativity is central to Imbolc), sleeping long hours (it is natural to the season) and lighting lots of candles (the primary symbol of Imbolc is a candle). I live far from many like-minded others and I often struggle to give my kids an experience of spiritual community. They are mildly resistant to our alternative dates for holidays at Yule or Ostara. The Summer Solstice, Lammas and Mabon just aren't quite right without a gathering of friends or community. But our home is perfect for Imbolc. This is truly the quiet time in our climate, surrounded by cold and frost. We light many candles and have time for more reflection and healing. The colors are stark and beautiful, white, gray and brown. With the sun returning a bit from the edge of the southern horizon, there is a realistic sense of a new year beginning. I have become specifically devoted to the goddess Brigid in the past few years and Imbolc is the feast day of Brigid. That makes it particularly special and a time to celebrate my connection to the goddess. Brigid is concerned with healing, fire, justice, creativity, inspiration and intuition--all aspects of Imbolc and all things at the core of my life. I celebrate Imbolc by making Brigid's crosses for our doorways and hearth. I do divination of various types and a ritual honoring the goddess. I often place a large platter in the center of the table with sea salt, crystals and seven white candles on it. My children and I make a Brigid doll to sleep by the hearth and have a family ritual of waking up Brigid after the winter's sleep. Imbolc can mean different things in different climates. For many people this is the day of seeds because the ground is ready for planting. It is still too cold in our climate for planing anything but hardy starts on window sills. The concept of seeds goes along with the Wheel of the Year as a life cycle in which Imbolc is conception, Ostara is the moment of birth, Beltane is exuberant youth and so on. In other places though, this day is associated with pregnant ewes, and the word "Imbolc" may have originally meant "in the belly." This is because it is a fallow time in many parts of the world. Plans and activities are in the gestation phase, not yet ready to be revealed. Growth is slow and hidden. If you would like to learn more about Imbolc or include this holiday in a multicultural program, check out Shanna and the Raven, an Imbolc adventure story. Shanna and her brother Rye celebrate the holiday amid magic and candlelight, but there are shadows in the modern world. The kids must use intuition and signs from a mysterious raven to protect themselves from a grown-up menace. In northern climates this was historically the time of candle making in households. There was little other work that could be done with the ground frozen and snow heavy on he earth. The year's candle supply was often made at this time and when northern Europe was Christianized, the holiday was transformed into Candlemas, in which the newly made candles are taken to the church to be blessed. There is certainly a connection to blessing candles and protection from fire. Brigid, both the Catholic saint of this day and the Pagan goddess of this time, is widely believed to protect homes from fire. In the Czech Republic Imbolc is still called by an old name "Hromnice" (Thundering). There is no thunder at this season, but the idea was that certain blessings or acts could be done at this time to gain protection from fire and lightening for the year. Whether you celebrate a specific holiday during the next few eeks or simply use the winter time for activities that get lost during the rest of the year, I wish you a good season of inspiration, healing and creativity. I know that by March I will be fed up with winter cold and gray. But for now winter is still young and fresh. New snow has fallen and our little town between the Bohemian hills is quiet under just a light haze of wood and coal smoke. "It's so good to have a hard frost," my husband says with an audible sigh of relief as he sips his coffee and looks out over the snow-dusted garden. "It will set the garden slugs and mold back It's been three years since we had a good cold shock.."
I know many climates don't have winter like this, not even cold, let alone with snow. But every climate has a fallow period, whether it is parching, cleansing heat or a deluge of rain to wash away the grime of the past year. Everywhere around the world there comes a time of the year for going within, for seeking out a cozy place with a comfortable temperature, for cleaning, refreshing and regenerating. Even though I loved sledding as a kid and I see my kids celebrating our little bit of snow with shouts and bright cheeks, I never realized until I was at least thirty that I look forward to this season of deep winter. This is one of the few times of the year when I am not constantly rushing and overloaded with work. End of the year deadlines have passed, tax deadlines are yet to come, outside work is either done or beyond help and life is settled into the winter routine. This is often the season when I do my best and most intensive writing. I wrote the first three books in my fantasy thriller series from January to March one year. It is a time for creativity and inspiration, as well as a time when there is enough space for those concepts. In ancient times the Imbolc season in the middle of winter was also considered the time of healers. Partly this was because people tended to get colds and viral infections in the damp and chilly weather. The elderly and infants were in need of greater care and so healers were in demand. But for injuries, this is simply a time when healing is more possible because physical activity is reduced. One of the reasons I celebrate the nature-based seasons with the Wheel of the Year is that by paying attention to natural rhythms, I never forget to give each need in my body and soul its due. I tend to be a workaholic at times and it is good for me to be reminded to allow time for regeneration, healing and inspiration. Inspiration comes only when there is enough silence. Healing comes only when there is enough stillness. This is nature's fallow time in the northern hemisphere, but whenever your fallow time comes, whether it is earth-based or personal, it is worth remembering that it is not a lost or wasted time. Rather it is a rare and precious opportunity for rest, healing, comfort and the quiet needed to awaken great things. These are the values taught in the Children's Wheel of the Year books (otherwise known as the Shanna books). I wrote them in large part to illustrate for my children and others how each season has its value. 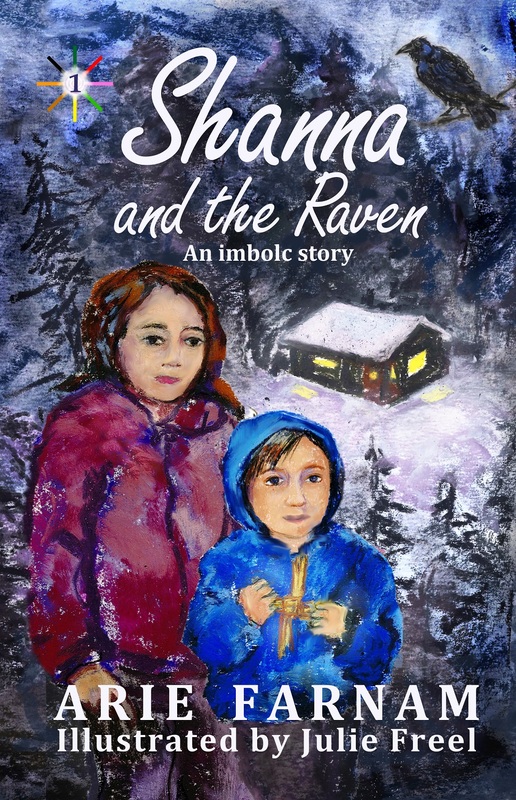 The Imbolc story Shanna and the Raven is a suspenseful story about a brother and sister who use intuition and creativity to protect themselves from potential danger. The Imbolc season is highlighted as the time of healing and inner knowing within a gripping, kid-friendly story. I don't make direct sales pitches in my emails often, but I would like to gently remind readers that now is the right time to order paperback copies of Shanna and the Raven in order to receive them by Imbolc. 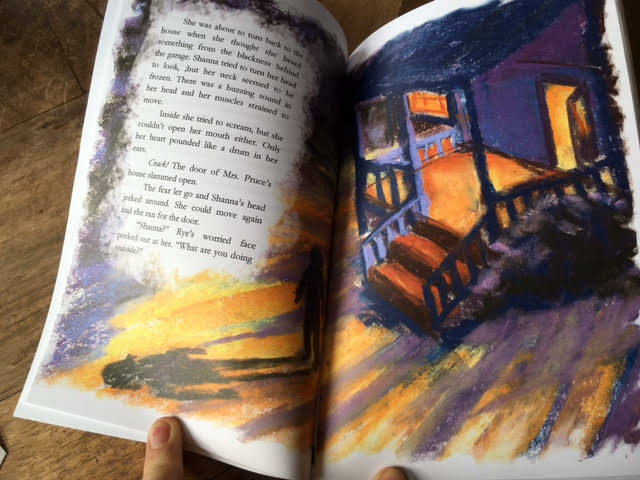 You can read more about the book and see photographs of the paperback illustrations here. Here's America's answer to Pagan Planet. which focuses heavily on the British Isles. The Goddess in America: The Divine Feminine in Cultural Context, edited by Trevor Greenfield, is an impressive anthology of Neopagan, Reclaiming and Goddess-oriented writers and it provides a valuable study guide for anyone seeking to understand Goddess-centered faith in America. Right off the bat, this book passes the first, most obvious and most often failed test when it comes to looking at Goddess spirituality in America. That is it starts before Columbus... long before Columbus and stays there for a solid chunk of the book. Kudos to the editor for that. It isn't a stance without its critics and dangers. The issue of the uneasy relationship between Goddess-devotees of European descent, Native American Goddess spirituality and cultural appropriation is addressed without any definitive conclusion. It's a sticky subject and there is essentially no way to satisfy everyone. Several authors weigh in on the topic in this anthology, all offering various versions of a moderate viewpoint: i.e. people should be free to honor goddesses other than those from their own genetic background as long as they do so with true respect and take the time to understand the cultural context of the goddess and give something back to the culture and community that the goddess comes from. Some authors have more exacting standards than others when it comes to correct respect but that is the general consensus. The book continues with a variety of perspectives on the historical development and contemporary character of goddess spirituality in America. Again, the editor has heard the calls for more racial diversity in such anthologies and the authors represent reasonable diversity within the movement, including Vodun and Hebrew goddess perspectives. The book is generally well written, excellently edited and interesting to read. Unlike some similar books there is little attempt to make it easy or light reading, however. The authors state their issues in all their complexity, which will make the book appropriate for university programs and other scholarly considerations. It includes several sections on pop culture, including an essay on representations of the Goddess in pop culture as well as the Goth movement, but these issues are handled from an analytical perspective, with respect for those who are part of these trends and yet without playing to a pop culture tune. If there is any issue in which I feel the book is not fully representative of American goddess-spirituality it is in the emphasis of several authors on Reclaiming. My broad experience of the on-line world of American goddess spirituality shows that both formal Reclaiming groups and the general values and ideals of Reclaiming are much less prominent in America than they are represented in this book. I personally love the Reclaiming movement, however, and I wish these values and ideals had greater sway in the popular goddess movement in America, so I don't take offense at its exaggerated influence in the book. I dearly wish more people today took social and environmental activism to the core of their spirituality and acted on the principles they profess. Instead I find a media landscape which deadens passion and ridicules those who stand up for their beliefs actively. Thus to paraphrase the motto of the Society for Creative Anachronisms, this is something like the Goddess in America--as she is and should be. This book sets out not just to document where we are but also to point a conscious way forward for the goddess community in America. All in all this is an excellent anthology on contemporary goddess spirituality and well worth the read. I once had the honor of guiding a young woman in her first full-blown Pagan ritual. She had been to some drumming circles and Tarot readings but not a ritual with all the besoms and wands. She had also grown up in a household where spirituality was a dire affair, strictly dictated and ruled by an angry God who would supposedly damn anyone who didn’t do it “just so” to eternal agony. She was eager for something different, but also anxious. What if we did something wrong? She was reverent and serious about learning. That is good and proper, and yet too much seriousness can be limiting. I was not all that experienced in leading rituals and this was one of the more complex I had done. It was Samhain and I wanted to do it right. I had very specific reasons for wishing to connect with ancestors, mine and others, that year. I had recently adopted two children from a different ancestry than my own and I wanted to approach their ancestors with honor and respect to ask for their blessing on the adoption as well. So, it was a serious ritual. But in the first moments, my informal apprentice mixed up the quarters. We all know it happens. She was flustered and worried. But I told her we didn’t have to worry. We started the calling of the quarters over again and did it right. Then I turned in the dim candlelight and knocked over a small bowl of libation water. I managed to catch the bowl, not break it and even save enough of the water that we could continue without interruption, but water splashed onto the floor. I started laughing. First, nervously but then joyfully. My young companion was startled. I explained that not being perfect is part of the ritual and so is laughing at ourselves. The rest of the ritual was punctuated by moments of laughter and once when we both started laughing for no good reason and couldn’t stop. But it was still one of the most powerful small-group rituals I’ve ever known. The energy was intense and I truly felt the blessing and protection of many ancestors. I tell this story because it is good to keep in mind that laughter has its place in ritual, as do mistakes and a bit of silliness now and then. Some rituals guide us to laugh away negative energies or to laugh in order to overcome difficulties. And these are good uses of laughter. That said however, silliness should not be the focus of every ritual. And while we should learn to laugh at ourselves and our troubles, we should not laugh at or mock ancestors, the spirits of the land or our gods, Some people are going to be rolling their eyes reading this and calling me a “pious Pagan,” whatever that’s supposed to mean. But I’m not actually saying that we should remain reverent in order to avoid curses and the thunderbolts of Thor. I was not raised with that jealous, angry god with a hell full of torment and fire, and yet I do see how fearing retribution for irreverence puts one on a slippery slope. That’s not what I’m talking about here. It is the mere fact of inner truth and faith. I was given the task of reviewing the book The Art of Ritual by Rachel Patterson. The book purports to give an overall basis for ritual. And yet it is full of attempts at lightheartedness, which are not particularly funny. It needs a good line edit. And it is more of an example of how to pretend to do ritual while laughing out of the side of your mouth to make sure your friends know you don't really believe this stuff. There are word-use and terminology mistakes, such as calling Mabon "the Autumn Solstice." ("Solstice" means "the sun standing still," which is the appearance when the sun’s movement changes direction at the Winter and Summer Solstices. It does not happen in any way at the Equinoxes.) In another gaff, there is an attempt at the re-imagining of the myth of Atlas, which falls flat when the author says Atlas was was relieved of his "turmoil" instead of "torment." There was no sense that the author meant Atlas had some inner conflict and outer turmoil would likely be much less boring than holding up the sky for eternity.. The honest mistakes may simply be the consequences of a small, over-taxed publisher and they can easily be forgiven. But errors close to the heart of the matter do dissipate the author’s credibility. More troubling still are the author’s references to matters of faith. Patterson says, jokingly, of her attraction to the god of life force and nature by whatever name he is called, “For me, it’s all about the antlers.” This and many other notes in the book insinuate that many parts of this spiritual practice are done for image and the street cred of the priest or priestess. While that isn’t out-of-bounds in and of itself, there is no corresponding depth or sense of real purpose in the rituals. The author talks about energy glibly, how to call this kind or dispel that kind. But the only explanation of energy or investigation of the purpose of ritual is contained in a tiny passage describing rubbing one’s hands together to raise heat and feel it between your hands. It is as if an atheist wrote a how-to cookbook for people who want to dress up as Pagans in order to impress their friends. I doubt that's the case. The author is probably a very spiritual person trying to navigate the market for books on Pagan issues. I think if the book were marketed not as the full "art of ritual" but rather as the outer "ritual tools and scripts" I would have much less to complain about. At every turn the author describes in detail physical objects for ritual or specific actions for ritual and then goes to extreme in denying any real need for them, never explaining that ritual objects and actions are aids to meditation and focus. Perhaps the author wants to avoid stating any of the reasons for ritual objects and actions to ensure that no one can contradict her. The problem is that this leaves the core of the book hollow. The focus on image over depth in this book points at a troubling demographic phenomenon in which many Neopagans are Pagan not because they believe in our gods but because they don’t believe in the angry god with those threats of hell. They are accustomed to “not believing,” and they see Paganism as a religion where anything goes and nothing is sacred. It is an identity to wear proudly but not one to internalize. Everyone has their own path and I don’t think most people dabbling in Paganism or witchcraft are likely to unleash some sort of negativity due to a lack of reverence. Our gods aren’t like that and I’m not here to judge others on their path, least of all those who have been through religious abuse and are most in need of some laughter. On the other hand, an overall frivolous and shallow approach to ritual isn’t what I would recommend. And thus I can’t really recommend The Art of Ritual as a general book on ritual. It may, however, be helpful to those who are too serious or afraid of negativity in ritual. Ritual to me must be rooted in some authentic belief, even if it is only the inexplicable sense that “there is something out there.” We shouldn’t take ourselves too seriously, but we should hold something sacred—at least the earth, at least the hunger and need in the world. In times as troubled as ours, when we are threatened by imminent and disastrous human-caused climate change, war and massive multiple refugee crises, the art of ritual should come primarily from what is sacred to those practicing the ritual. Ritual is first and foremost about deepening either personal or community experience and there is no word about this in The Art of Ritual. When we do rituals imperfectly and laugh to free ourselves from fear, it is an opening of spirit. When one laughs at the deepening experience of ritual, the spirit closes. The Neopagan community today is an odd combination of a publisher’s Summerland and a publisher’s Hel. There are wildly popular markets and bewildering hundreds upon thousands of books on some Pagan topics—cookbook-style spell books, books promising an instant cool factor and a good many serious books on specific gods, goddesses, methods and re-constructionist traditions. But there are some areas of great interest and concern that are untouchable, effectively off-limits to most publishers. There is no conceivable way to enter this swamp without being criticized from one quarter or another (or all at once). It reminds me of writing articles from the interethnic war zones of the former Yugoslavia. The only way I knew I was even slightly on track was when I worked very hard to understand every side and then everyone was angry when I went to press. When one side was totally happy with me, I worried. That makes me think the book Bringing Race to the Table, which tackles the issue of race in the Neopagan community is doing a damned good job in a difficult crossfire. There is no way that anyone will be 100 percent happy with all of the opinions expressed in this anthology, because the authors don’t all agree with one another on all issues. I would give this book top marks, five stars or whatever the equivalent, not because I agree with everything in the book. I have some quibbles. But because it does an excellent job of tackling such an incredibly difficult issue. And my quibbles are all on matters in which I agree with some of the authors but not others. I learned a massive amount by reading this book. Being white, I learned fast and hard during the first half of the book, which reflects more the perspectives of people of color in Neopagan communities and I squirmed uncomfortably at times in the second half which reflects more the perspectives of white people. But this anthology represents most essentially an act of great courage both by the publisher and the authors, treading into a minefield and making a blessed good stab a very hard task. As a white Pagan who is part of a racially mixed family, I have become convinced over the past five years that the issue of race is the Achilles heel of the Euro-centric Neopagan movement. I believe that we either solve this problem, clean the skeletons out of our closets and lay them to rest or our movement will go the way of the Flower Children, to be remembered by future generations as a short fling with reinvigorating ancient Paganism, an attempt that was doomed by deficits in spiritual depth and inclusivity. Is Paganism a fashion statement or a religion? That is the question and oddly enough race is at the core of it. Many Neopagans have been hiding from the issue of race, pretending that “European Paganism,” which somehow ended up including Egyptian, Romani (Gypsy), Middle Eastern, Classical, Celtic and Heathen Paganism but nothing else is somehow distinct as a “religion” and that we can clearly identify a tradition, a goddess, a culture or an individual as “European” or not. In this paradigm race becomes a non-issue because the nature of this “religion” is that it originated in Europe. I hate to break it to those folks, but Egypt is not in Europe anymore than Nigeria is. And there is nothing all that unique or unified about European Pagan traditions. Celtic traditions share a lot of similarity with Native American beliefs. Most Pagan traditions worldwide share many similar tenants and often eerily similar details in mythology. Any line we draw around one continent’s Paganism is an arbitrary line and thus a line that cuts open the can of worms called “race,” no matter how hard we try to hold it closed. The trouble Neopagans have with race begins with the fact that we don’t talk about race. When Moon Books sought to create an anthology of Pagan thought in the 21st century and titled it Pagan Planet (not Pagan Anglo-Empire), they forgot to include anything about non-European Pagans. It’s an all too common pitfall. But worse than that, some Pagans do talk about race—just carefully and when it is about the white race. During recent racially charged incidents in the United States and Europe, I have seen several news items posted on Pagan forums with emotive posts in support of white parties in the conflicts, but I have not seen Pagan posts sympathetic to victims of crime who are people of color. When I recently posted a news item critical of white supremacist groups in the United States on my own page (and thus not intruding on specifically Pagan forums) I was insulted and shamed by several members of Neopagan groups to which I belong who noticed my page. This may seem little different from the regular verbal sparring over political and social issues that goes on every day on social media, but after long observation on Pagan forums, a pattern emerges in which most members of Neopagan groups are silent about injustices against people of color. A vocal minority in the Neopagan on-line community shames and attacks those who speak up for people of color while posting their own racially charged items that favor people of white appearance. No one in turn shames or insults these white-favorable posts in Neopagan forums. Those of us who dislike such posts generally want to keep the peace and we hope the racist end of the Neopagan community will somehow just go away. In the end, there is an atmosphere where discussions of racial tensions in society is taboo with the exception of posts favorable to white-supremacist and European-heritage-only Pagan groups. It is difficult to imagine that people of color could feel comfortable in such a community. The lack of a non-European perspective in the book Pagan Planet is a clear symptom of the problem. A book that references the whole planet, that is supposed to take a broad look at Paganism in the twenty-first century, published by a respected Pagan publisher—one of the most up-to-date books of its type—contains almost no mention on race. That’s why we needed Bringing Race to the Table, edited by Crystal Blanton, Taylor Ellwood and Brandy Williams. There is a difficult interethnic tension in the very term “Pagan.” Many non-European indigenous religions that would otherwise fit the definition of an earth-based polytheistic spirituality, are not considered Pagan either because their adherents vocally reject the Pagan label or because European Neopagans fear that they might be offended. Thus Hindus, Native American spiritual practitioners, Santerians and many others are often not considered “Pagan,” despite fitting all of the definition except the “European” part. There are some corners of the Neopagan community where groups openly state that they are only open to those of European heritage, justifying themselves by saying that there are groups which are only open to those of Native American or African heritage and insisting that they wish to have an authentic Re-constructionist experience of their ancestral spirituality. I personally have encountered a related problem. As an obviously white person with light-colored hair, I was allowed to attend several Neopagan events in Central Europe until local groups met my children, who have darker skin and hair. Then I was given the cold shoulder and told that only European practices and deities were acceptable, even as organizers of the event held a large ritual honoring Egyptian gods. Somehow European Neopagans have decided that Egypt is part of European, not African, heritage. Genetic exclusivity is a thorny issue, because there are indigenous spiritual groups from many continents who maintain genetic exclusivity as a means of protecting their cultural and spiritual treasures from continued exploitation and colonization by those in possession of greater wealth and power. This is one of the areas where I disagree with some authors in Bringing Race to the Table. I understand that there are good reasons people of color must protect indigenous traditions and European Neopagans don’t encounter the same pressures. However, the world is now full of racially mixed individuals such as Blanton as well as the descendants of indigenous individuals who were removed from their culture of origin and either adopted or “reeducated” in boarding schools and other institutions. These individuals, both mixed race and those whose cultural heritage has been stolen or hidden from them (and thus who may not even know of their genetic background) are harmed most by genetic exclusivity. Beyond that, many people of European heritage now live on land that was stolen from indigenous peoples many generations before. While wallowing in guilt over what one’s distant ancestors did helps no one, to simply transplant European Neopagan traditions to these lands and utterly ignore the indigenous traditions of the land on which one lives feels callus and simply spiritually wrong. The issue of cultural appropriation is related, however, and it causes significant confusion in Neopagan communities. Unlike the few genetically exclusive groups, most Neopagans insist that they want more people of color in their circles and that because they embrace various parts of Native American, Asian or African cultures or spiritual teachings, they are multicultural and welcoming of people of different races. The problem is that this very adoption of bits and pieces from other cultures (and most often the adoption of the titles of spiritual leaders such as “Shaman” or “Medicine Woman” and identifying one’s self as one of these without clear knowledge of even which culture the term belongs to) is often felt as a slap in the face by people of color. It can feel like the flaunting of the spoils of colonialism and when those from outside the culture set up shop as teachers of an indigenous culture in order to profit from their incomplete knowledge, it adds insult to injury. While such practices are well-meant and authentic to the practitioner, adopting a term such as “Shaman” and using it out of context—Shamanism technically is Central Asian and does not refer to all out-of-body journeying techniques—can make people from indigenous cultures mentioned uncomfortable and thus alienate them from Pagan circles, where they might otherwise find an appropriate umbrella for their spirituality. As a result, some among both whites and people of color insist that cultural appropriation occurs when those not born to or given primary access to a certain tradition use the symbols, teachings, terminology or practices of that tradition. However, this is another area where the authors of Bringing Race to the Table don’t have consensus. Reluctant Spider, a writer of African heritage, rejects the rigid genetic/ethnic measurement of cultural appropriation. She points out that unbiased application is impossible when some Greek myths have African origins and even Thor has ties to Ethiopia. Several authors of Bringing Race to the Table struggle to define the exact boundaries of cultural appropriation. Is it a question of power imbalance, when those with greater access to education, wealth and leisure time take what they want from those with less resources for spiritual study? Is it the cherry picking of only some terms, images or misrepresented concepts from other cultures and interpreting them through the lens of one’s own culture? Is it when the mystery of another culture is used for gain, whether to sell something or to claim titles and positions of spiritual authority? There is no easy answer but the common theme seems to be the attitude and respect with which we interact with other cultures. Neopagans do often give that respect when taking from other sources but sometimes they don’t. Paradoxically, the final reason that people of color often don’t feel welcome in Neopagan communities is a lack of respectful and culturally sensitive inclusion of the deities, terms and practices of non-European earth-based traditions. Essentially, there must be some respectful cultural integration in order for Neopaganism to become inclusive. For instance, most encyclopedias of deities popular in the Neopagan community either put the vast majority of their focus on European and classical deities or include deities of various continents with the conspicuous exception of sub-Saharan Africa. Naming the Goddess, edited by Trevor Greenfield is an example. The latest edition of the Encyclopedia of Goddesses and Heroines by Patricia Monagham includes some African deities but they are only either Egyptian or African diaspora deities and this is the far progressive end of the spectrum with countless books entirely devoted to northern European and classical deities. Reluctant Spider, one of the authors of Bringing Race to the Table, set up an objective experiment to determine the acceptance and placement of non-European deities and images in the Neopagan community. Because so much of the community is on-line, the on-line reflection of the community can be assumed to be fairly true of overall attitudes. And because the rankings of Google searches are based primarily on popularity statistics, such searches can accurately reflect what is appreciated in a community, as well as what has the backing of major organizations and funders. Therefore, Reluctant Spider used Google Image searches as an objective measure of the prevalence of images of non-European deities in 2014. She searched for specific terms and then counted the number of images of Caucasian deities one had to pass by in order to reach a single image of a non-European deity. First she simply entered the term “Goddess.” After 21 images of European goddesses, she encountered one Native American goddess. After two more, at number 23, she encountered a Hindi image. There were 35 images before she found a goddess image with skin dark enough to be conceivably African, although the image had European nose and lip features as well as bright green eyes. After 65 images she finally encountered a tree nymph with a green leafy afro. There were occasionally other Hindu images as well as Egyptian iconography, but there were no other black African goddess images. She stopped counting at 200. Clearly, filtering the original search for Neopagan sites resulted in an even more extreme lack of multicultural images. I have unintentionally replicated these experiments many times while searching for appropriate Goddess images for my racially mixed family and coming up frustrated. It is important to remember that it is the actions and preferences of millions of Google users—what they share and pay attention to—that is reflected in such a Google Images search. This makes these results all the more troubling. We have no one to blame it on and it is very likely to be a true reflection of the aesthetics preferred by most English-speaking Pagans today. Bringing Race to the Table is the best source of material for investigating these issues at present. I wish it could be required reading for all Neopagans. Given that that won’t happen, I hope that Neopagans who do care about these issues will read it and be vocal about the problems. Our future depends on it. “The road forward in an inclusive community would have to start with an honest evaluation of how our actions are causing intentional and often unintentional harm by setting a culture that is not welcoming or embracing of those who do not fall within the walls of our Euro-centric overculture,” Blanton writes. Like a wondering child I step out in the new morning. I walk to stand before the fire. And I raise my face to our infinite sky. our wet, rich earth beneath my feet. Oh spirit, I recognize you now. Earth mother, you've always been here in all things. Through all things has your spirit loved me. in this truer world of spirit and living earth. Heads up! 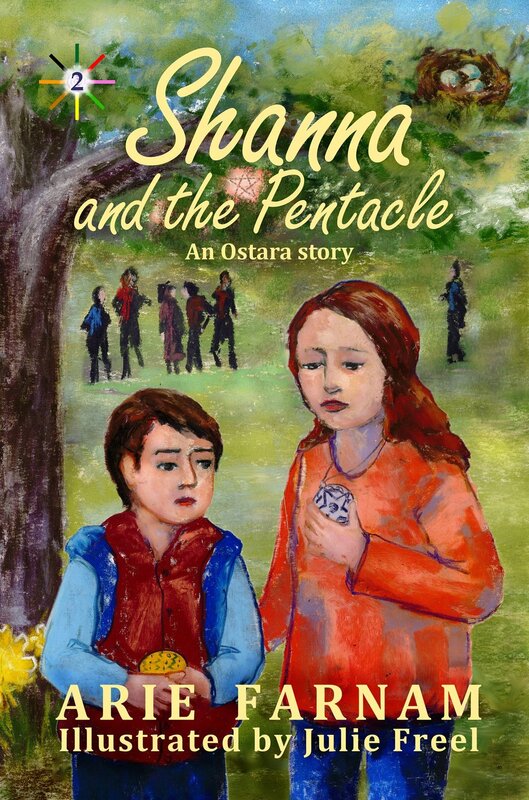 Shanna and the Pentacle, the Ostara story of the Children's Wheel of the Year, is now available in Kindle and paper back editions, but Amazon has yet to put them on one integrated page. Here are the links. And the courage to stand your ground. Here is a story for Pagan, Wiccan and earth-centered families to share the wonder of the Wheel of the Year. Ostara is a time for buds and shoots, for the smell of wet earth and for asserting your true self. A new beginning can be hard but it’s worth it after all. Ten-year-old Shanna and eight-year-old Rye are starting out at a new school just before Ostara. A teacher notices Shanna’s pentacle necklace and asks her to take it off. Brandy, the popular girl, says Shanna is going to “hell” and Rye has his own trouble with kids who say boys don’t draw or sing. Still the magic of Ostara is at work. Shanna and Rye can meet new challenges and find new friends. Like Shanna and Rye, children from earth-centered families often stand out in mainstream society. Without strong identity and confidence, they struggle to choose their own path. The Children’s Wheel of the Year books provide concepts our kids need to face these challenges. The Ostara story of the Children's Wheel of the Year is finally here! With no time to spare... but we made it. The Ostara story of the Children's Wheel of the Year series is out. Shanna and the Pentacle is everything I hoped--an adventure story that will have kids rooting for the characters. It's also an example of how to deal with bullying problems and the often difficult new beginnings in life. There are more wonderful and evocative images by Julie Freel. Ostara is a time for buds and shoots, for the smell of wet earth and for asserting your true self. A new beginning can be hard but it’s worth it after all. The book is currently available in Kindle format and will be out in paperback and other digital formats next week. Look on the Children's Wheel of the Year site for minute-by-minute news about new formats. I walk onto the playground and check my posture, my expression, my clothing. A group stands on the sidewalk halfway to the gate. I approach, carefully crafting a mildly pleasant but not overly enthusiastic smile. My stomach tightens in knots and I concentrate hard, trying to find the dim blotches of eyes on pale oval faces. I can’t see them, but they can see me. Like a perpetual foreigner in a land whose language is beyond my physical capabilities, I try to play the game of eye contact and greeting. I’m not a child on this playground. This time I’m a mother. My kids spin away from me toward the playground equipment, yelling to their friends, as I join the loose circle of grown-ups on the sidewalk. A man is handing out forms. That’s good. Maybe this is the leader of the mini-Scouts group I signed my kids up for. That’s the purpose of my trip to the school today and it would be great if I could find the group so easily. I lean a few inches toward the woman beside me. “This is the mini-Scouts group, isn’t it?” I ask. My white cane is in my hand and most of these parents know me anyway. They know I can’t see much. My question should be self-explanatory. But the woman edges away and pretends she didn’t hear me. The man handing out the forms has become flustered and the circle is losing cohesion. The man talks to a couple on my other side, turning his back to cut me out of the conversation. I wonder if he thinks a random blind person has wandered into his group and he doesn’t know how to handle it. Many people can’t conceive of the idea of a visually impaired parent. I could almost laugh about that, but the knots in my stomach tighten. By the man’s words and explanation to the other couple, I glean that my guess is correct. This is the initial meet-up of the mini-Scouts. Now to get one of those forms without a major public humiliation. I wait and try to make out if I know anyone in the circle. The woman who edged away from me seems to be a neighbor from a few streets over. I’ve heard that she’s signing her daughter up. We’re on okay terms in private, but she still won’t exactly say hello in public. I know I’m dressed well, clean and groomed. I don’t wear makeup or dye my hair, so some moms will turn their noses up over that alone. But mostly the shunning has to do with my eyes. They’re squinted half closed all the time. My eyes are small and raggedly, restlessly moving, rarely ever even appearing to make eye contact. They make people uncomfortable. I don’t entirely blame people for feeling that way. I know that strange-looking eyes bring up a primal response. People usually aren’t trying to be cruel, but my whole body is tense now. The man with the forms turns away from the couple and rocks back and forth. I can make out the blurry bulk of his shape craning to see other parents he’s missed. I’m three feet in front of him, but he pretends not to see me. I greet him anyway, forcing a smile. My words are drowned out as he calls to someone behind me and swerves around me toward a woman approaching with a stroller. He hands her a form and starts explaining about pick-up times again. A roaring, buzzing sound seems to have taken over my ears. I feel dizzy and a lump is suddenly blocking my throat. Why is this so damn hard? If this happened once in awhile it would be one thing, but it has been happening again and again. I want to give up and walk away. I would if it were anything I could forgo, but my kids want to be in this group and they’re still too little to be expected to take the brunt of these situations. I can’t recognize her at ten feet but I could kiss her whoever she is. I grin and wave. The man with the forms turns back around, confused. But the woman with the stroller moves to make me part of her conversation with him. Now he has to acknowledge me. I greet him again, forcing my voice to stay steady. Now he returns the greeting and hands me a form. The mini-Scouts meeting is the tiniest of incidents. I’m not complaining about it, simply telling it like it is. These types of routine social interactions are often like this for me. This one was only unique because of the woman who made it clear to the leader of the group that I belonged there. It could have been much worse. That woman is one of those people who understands about social exclusion or simply is conscious about her own reactions to appearance. But three of my near neighbors who stood in the group did not say hello or give any indication that they knew me. This happens. And among adults it usually ends at that, a bit of exclusion but nothing overtly mean. Among children, however, difference and social exclusion can easily lead to more—to bullying. I’ve always been legally blind—thus an oddball as a kid—so I’ve dealt with my fair share of bullying. My family was also very alternative, including in spiritual matters, so my brothers and I got flak for that as well. My brothers were harassed about having long hair or different clothes. Back in the early 1990s my mother told me her job could be at risk if people found out about our alternative spirituality or using Tarot. I was never harassed about not being Christian at school, because I was never dumb enough to let anyone find out. That’s why I chose bullying and social exclusion motivated by prejudice as the key issue in the second book of the Children’s Wheel of the Year series. Some people have questioned my choice to make the theme of the book something “negative.” It’s supposed to be an Ostara story, after all. My take on it is that the bigger the problem is, the greater the relief when we come into the light. Beyond that, the issue grows directly out of the concept of new beginnings. It arises for the children in the story, because they enter a new school. The issue of bullying and specifically the issues that children from earth-centered families face in a society where some large groups of people truly believe that our symbols and beliefs are “evil” are reality for children. Silence about these issues from trusted adults doesn’t shelter children. It only makes them feel alone. When I hear about children who are ostracized or even censured by teachers for wearing Pagan or earth-focused symbols on jewelry or clothing—something that I do hear about every month or so—I know in detail how difficult it is. Most Pagan children who face bullying or prejudice at school will encounter only a bit of it and will not be completely isolated by it. But there are cases today, especially in religiously conservative areas, where harassment can become serious. It is crucial that kids know first that this kind of prejudice isn’t acceptable and that if they are targeted by it they aren’t alone or to blame. Portraying common stories in fiction is one way to give kids a sense of connection to others who may deal with the same issue. It also helps to teach sensitivity and empathy. The best kind of children’s books are those that have a strong story, a conflict or adventure that children can relate to. And when they teach something, these stories should do so in a way that is sensitive to the feelings of children. The story shouldn’t stop in order to teach and it shouldn’t talk down to kids. The Children’s Wheel of the Year books do teach. In particular the upcoming book Shanna and the Pentacle shows ways of dealing with bullying--both things a parent can do to help and things a child can do alone, such as talking openly about the problem and focusing on those peers in a classroom who are open-minded and friendly. But these books teach through providing a good model and creating a suspenseful story around the issues. In Shanna and the Pentacle, the upcoming Ostara story in the Children’s Wheel of the Year series, Shanna and her brother Rye are the new kids at a larger and more diverse school. One teacher and the popular girls are convinced that pentacles are Satanic and Shanna runs into trouble because of the pendant her best friend gave her before she left her old school. New beginnings aren’t always easy, but Shanna can find ways to celebrate her new life and the Ostara holiday even amid these tensions. She also learns how to keep her own equilibrium in difficult situations, how to stand up for her beliefs and how to make friends despite differences. Shanna and the Pentacle is the second book in the Children’s Wheel of the Year. It will be published later this month. What are the diverse experiences of contemporary Pagans of an indigenous European bent? What are the challenges of reclaiming and integrating ancient beliefs in the twenty-first century? What are our values and how do we act on them? There may be some blogs and other online sites that discuss these intense and complex issues that take the Pagan community beyond romantic ideas of candles, crystals and witchy hats, but they are scattered and often jumbled in with other things. Getting a balanced view of where the Pagan community really stands by skimming such websites would be a daunting task. That’s where the book Pagan Planet (edited by Nimue Brown of Moon Books) comes in. This is an anthology that sets out to chart the breadth and depth of the contemporary Pagan community. The subtitle Being, Believing and Belonging in the 21st Century brings issues of identity, faith and ethics to mind. Here at last is a credible attempt to take a serious look at Neopaganism without any delusions or fetishes, simply as a contemporary way of life. For that, it is most welcome. The list of authors and topics in the anthology is delightful and intriguing. There are essays on specific issues and musings on life as a modern Pagan, even a poetic or fictional bit or two for added flavor. All around, I was not bored reading this. The writing is varied, and professional--the cream of the Neopagan community. I found a few of the insights particularly gripping, especially when they had to do with how Pagans act on the values promoted in our teachings, such as honoring elders and ancestors, helping those in desperate poverty to gain self-reliance through Pagan Aid and protecting the earth in many valuable ways. As a Pagan parent I found the pieces on Pagan parenting entertaining and the entry on Authentic Shamanism was fascinating. All this is contained in the book. At the same time, many of the authors were clearly aware of the eyes of history reading their words as well as today’s readers. They were not only setting out to reflect our community back to us. They were also attempting to document a moment in the development of Neopaganism to say essentially: “Here in 2016, this is where we stand. These are our struggles, concerns and achievements. Let it be remembered.” That too is a good and honorable task. Because of these goals, this anthology is almost too broad. In trying to look at all the diverse aspects of Pagan life, it is limited in its ability to explore in great depth. That isn’t a serious flaw because we need a book that takes into account many different issues. There are already books on many of the specifics. And at the same time, I was disappointed in one aspect of this book--its focus not just on indigenous European traditions but the heavy emphasis on the British Isles in particular. This is a more serious limitation because it purports to give a global perspective. While there is a southern hemisphere piece and a few North American entries, most of those that mention place are in the UK or Ireland. It is beyond sensitive to tread on the borderlines between European Pagan traditions and other indigenous and earth-based traditions that have mostly not adopted the word “Pagan” though they essentially fit the description aside from not being European. I recognize the difficulty of forming bridges to other earth-based cultures because of the issues of cultural appropriation and historical colonialism, However there are so many of us who dwell in the borderlands between European and non-European ancestry, lands and cultures (whether we like it or not) that we ignore this aspect at our peril. This book shies away from earth-centered traditions of non-European in origin with only the briefest mentions of trading vague comments with a fellow Shaman in Africa and one author who admits to mixing in some Native American ideas with a careful caveat against usurping Native American culture. However, this last was another case of someone living in Ireland, not dealing with Native American culture because of proximity or the ancestry of one’s land, but because it is personally interesting. I offer that as a critique not in order to tear down a good and much-needed book, but to ask for our community to stretch even further in the issues we dare to talk about publicly. I grew up on a plot of land that tangibly spoke of fairly recent Native American ancestry and this influenced my understanding of the world, history and spirituality. I am now raising two children of mixed ancestry, who will have to bridge the gaps between Europe and other continents. I would like them to grow up into a Pagan community that is more inclusive of those who are not all European. Globally as well, the issue of race cannot and should not be ignored. Another enormous issue that is barely touched in this book is climate change. Many of the authors in this anthology are active in the anti-fracking movement, an extremely important part of the environmental struggle. And yet there was almost no mention of climate change and the challenges the next generation will face, including ethical issues when faced with massive waves of refugees and real hardship encroaching on the edges of our community. Our children will struggle with these and other heavy issues. Can we give no sign posts or explanation to the next generation who will have to struggle with issues so painful that we barely dare to touch them? All in all, Pagan Planet is a good book discussing issues important to the Neopagan community with some geographical and cultural emphasis on one area. It should be included in comparative religion and multicultural courses, studied by those beginning a Pagan path and discussed with passion and gusto by experienced Pagans. Watch this space once you click "subscribe" for instructions on how to get your free book! Imbolc blessings to children, parents and grandparents! Imbolc is the time of firelight and long evenings. It is a time to curl up indoors, to think, to dream and to read. There is no better time to delve into the mysteries of intuition, magic and hope. I'm a mother and Julie Freel, the illustrator of the Children's Wheel of the Year series, is a grandmother. Our first concern is that children can access books that support earth-based spirituality. That's why we're making the ebook of Shanna and the Raven available for $2.99 on Amazon and other ebook stores until Imbolc. This means we take a loss on some copies of this book, but it also means that it is affordable for everyone knows a child who would like to read or listen to this book. Check out the prefer paperback you can get a copy from Amazon and see photos from the inside here. "I'm not a Gypsy!" a thirteen-year-old boy in a Romani (otherwise known as Gypsy) settlement in Eastern Europe once told me. "Do I look like I have some kind of free and easy life? I don't have a wagon or one of those funny round guitars." I was a journalist at the time--supposed to be impartial and not interfere with the natural course of events--so I didn't do what I wanted to do. I have since regretted that I didn't put an arm around the kid's shoulders and say, "I hear ya, brother. I know what it's like to have your identity usurped and dragged around to serve various fashion trends and self-indulgent subcultures. Don't let that stop you from knowing who you are." I do know because my identity is bound up with similarly loaded words. And when I first started writing Pagan children's books that was the greatest obstacle I faced. Many people who I expected to be supportive (because I grew up with their earth-centered spirituality) were skeptical and even resistant to the idea. "If you use words like 'Pagan' or 'magic' or 'witch,' you're going to limit the types of people who will read the book," one critic told me in no uncertain terms. "And a cauldron? I mean seriously! I can't believe you called it a 'cauldron.'" Other times I've heard people who clearly practice earth-centered spirituality say essentially the same thing that the Romani boy told me. "I'm not Pagan," one said. "When people hear 'Pagan' they think about immature mind games, hedonism and irresponsibility. It's the sort of thing that teenagers play around with just to annoy their parents. It's not a serious earth-centered spirituality." There are always tough decisions to make when presenting a book to the world and foremost among them is "Who am I writing this for?" I had to keep that question firmly in mind as I navigated the publishing process for Shanna and the Raven. The answer is that I wrote it for Pagan and earth-centered families. I want people who share these beliefs to be able to find the book using those search terms. And I'm not as interested in what everyone else in society thinks those terms mean. And moreover, I have two children myself and I think about what it meant to me to grow up with an identity that had no socially acceptable name. I know there are a good number of people in the United States, Europe and Australia who accept the term "Pagan" readily. However, the fact is that there are many more people (possibly several times our number) who share our essential beliefs yet don't accept that term. That's why it's worth addressing the issue of why I use the specific term "Pagan." I grew up with earth-centered spirituality but I didn't adopt the term "Pagan" until I was about thirty. That was mostly because I spent many years looking for a word that could accurately convey my meaning. Over the past twenty years many terms have become well-known--some ultra specific like "Wiccan," "Druid," "Asatru" or "Reconstructionalist." Some vague or only used by some, such as "New Age" or "goddess culture." I chose the term "Pagan" for one simple reason. It is broad enough, yet to those who accept it, it means what I am trying to express. Thus if I find someone who identifies as Pagan and I say that I am Pagan, we both have a rough idea of what that means. Not perfect, no. But look at the wild diversity of Christianity or Islam. We're hardly alone in not being uniform. The term "Pagan" is also used in a specific way by serious news media. In the code of newspaper journalism, one should call a group "Pagan," if it represents an indigenous belief system with strong ties to nature and probably several gods or goddesses. Recently I have seen newspapers refer to tribes enslaved by ISIS as "Pagan" because they fit those criteria. Thus the term "Pagan" Is not exclusive to indigenous European religions, although it is most often used that way. I know I'm treading on dangerous ground among fellow Pagans, asserting that I have a firm definition for the term "Pagan." But it isn't so much that I have that definition myself. It is that I accept and identify with the standard definition of the term. I don't fight the meanings of words because the most popular definitions of words will prevail in over time and resistance in this case really is futile. If I had come of age and discovered that most people called the beliefs I hold "gobbledygook" I would have identified with that term and fought for its correct interpretation and positive identity. Thus I don't fight against the term but rather for its clearer understanding. Get the Pagan children's book Shanna and the Raven here. That is why I use the term "Pagan" both for myself and to my children and in my children's books. Yes, "Pagan" originally meant something like country bumpkin and it wasn't specific to a religious path. But it is now. It has a commonly accepted definition, whether we like it or not. Seriously, we need to stop whining and be glad for the identity we have. Show me a better or more understood term, and I'll seriously consider it. But for now "Pagan" is the term we have. The term "Witch" is in a similar category, though the road to the broader understanding of that term will be even more rocky. Why do we need an identity term? There is another argument I encounter in the community discussion on this issue and that is that some people strongly believe that we don't need terms of identity at all, that these are just "labels" and actually potentially damaging. I do understand the idealistic and positive intention behind these concerns. We should all be human beings first--dwellers of this earth and universe, in kinship with every being. But... you knew that was coming, didn't you? But we don't live in an ideal universe and neither do our children. The concept of rejecting all labels and merging into one big happy identity is akin to the argument for "colorblindness" among many white people in the United States or Western Europe. The lack of identity works just fine if there are truly no distinctions or problems between people in society. However, if there is any measure of tension, lack of identity works in favor of those associated with the largest and most privileged group and to the detriment of minority groups. Many of those who embrace earth-based spirituality today grew up in another religion with a very distinct name, and part of their change is to release themselves from names and labels, so our community members often balk at terms such as "Pagan" or even "earth-centered." It's understandable. However, there is an issue here that goes beyond the desires of individual spiritual development. These first-generation Pagans did grow up with an identity, one they could understand, make decisions about and even reject because it had a name. And they also grew up in the majority culture. Children raised in earth-centered families are not fully in the majority culture and they often lack the words needed to make their own decisions about their beliefs. That was why out of all the worthy topics for children's books, I chose to devote my first books to stories of contemporary Pagan children. As I write the second book in the Children's Wheel of the Year series I note that the only times identity labels are needed or even arise in these stories are when the characters encounter hostility from the majority culture. We could live happily without labels, if we lived in isolation. But we don't and our children don't. If you send a child out into the world after teaching them values and stories that are very different from those of the majority but give that child no words with which to think consciously about such things, you send the child into inevitable confusion and pain and cut the child off from a sense of belonging. Psychologist Abraham Maslow defined a hierarchy of needs, beginning with physical needs for food, shelter and safety and culminating in self-actualization. The theory, which is used widely by psychologists, is that one cannot progress to higher levels without fulfilling the lower needs on the hierarchy. Thus to reach self-actualization an individual must have basic physical needs met. And directly above the basic needs of the body and safety is the need for belonging. For children to fulfill the need for belonging in the majority culture, they must feel that their ideas, values and beliefs are supported and shared by others at least to some degree. The facts of today's world are that many Pagan children encounter not a world where labels don't matter but a world where their beliefs are disregarded or rejected and their celebrations are unknown or mocked. In such a world, children must still have belonging in order to reach self-actualization and that belonging comes from the understanding is that there is a community out there--though scattered--that shares and honors their values and stories. That is why we need a Pagan identity. I would like to invite you to my hearth-side email circle. This is an intimate group of readers with whom I share a weekly virtual cup of tea and links to my latest posts. To add to the fun, by joining my hearth-side email circle you earn a free ebook of your choice from my Books by the Fire collection. It isn't suave to make this kind of confession, but in this case its necessary. I was afraid of the dark as a child. Very much afraid. I wasn't afraid of monsters under the bed or of ogres in the closet. At least not unless I had recently watched a scary movie. Adults would often ask me what I feared and it was impossible to say exactly. I feared the tingling pressure of darkness against the back of my neck. I feared the way my muscles tightened and sometimes I couldn't move, even though I was fully aware of my surroundings. I feared the sense of consciousness and non-physical forms that I couldn't possibly understand. But as a child I didn't have words for these things and so I simply clung and refused to be alone. I found that darkness was actually only part of the problem. The other part was being alone. I found that the pressure against my senses didn't come if I was with another person... even a child much smaller than me. It wasn't that I thought a smaller child could protect me from something malicious. I didn't fear harm. I just did not like the strange pressure and awareness I felt but couldn't understand. And that feeling lasted until I was well beyond childhood. Today I understand better what I perceived as a child. I had some sort of gift for sensing non-physical reality. Despite the fact that I had very poor eyesight and couldn't see the facial expressions of others, I often sensed the emotions of others correctly, even when they wished to hide their feelings. And several specific experiences convinced me that I could at times perceive non-physical beings. Because I couldn't understand what I perceived, it was frightening and some of it may have actually been negative and beyond the abilities of a child to handle. It is because I've experienced this that I have a lot of sympathy for children who have fears they can't describe. Some of these fears may come from sensing non-physical reality. Others may come from deep memories or previous traumatic experiences that are not consciously remembered. Either way, there are ways to deal with these fears that address the root cause and allow children to keep their emotional and spiritual sensitivity without being afraid or encountering psychic negativity. In popular western culture today, the primary response of adults to a child's fear of the dark or the unknown is either suppression, denial or mockery. "Look. There's nothing under the bed. Just calm down and go to sleep!" or "If you just be brave and ignore it, it will go away." From my experience, these usual responses are utterly useless. Most children just suffer through it until they are old enough to block out the non-physical world. And that can seriously limit their sensitivity and ability to know themselves and reach their potential. A few more creative adults make a game of battling those things that trouble the child, dressing up in capes with swords and charging around the bedroom to exorcise the monsters. This latter approach does often work, and that's more than just because it's fun and distracting for children. It is also because such games often contain the basic elements of energetic ritual. That is where the real solution lies. If an adult is skilled in their own spiritual path and can keep a steady center while giving a child the tools of self-protection and energy conservation, lengthy struggles with these fears can be avoided. And the child can grow to develop psychic gifts to their fullest without having to put blocks on their sensitivities. I have seen people of various religious persuasions do this in various forms--from Christians to a Cuban voodoo practitioner. So, I can't say there is one "correct" way to go about it. But the basic elements are common. An adult should help a child to create a safe psychic space, often a circle. There may be candles or other items that help in concentration and a feeling of peace. Teach your tradition's form of centering, whether that is through visualization, meditation or prayer. Then cleanse the negativity in the area in a way that makes sense to you, such as smudging with herbs, drumming or prayer. Set a boundary around the room or home, using substances (such as salt and herbs) or protective symbols. And give the child a symbol or talisman of psychic protection. Talk about energy and spirit with the child in terms the child can understand and explain what you have done. Don't forget to close the sacred space and give thanks. Even this very general description may go beyond the spiritual experience of some adults. I don't expect those who believe solely in a materialist world devoid of gods, ancestors and spirits to agree with my perspective on this. I'm not a guru and my own spiritual path is very personal and eclectic, reflecting my varied past and international family. However, I can offer a more concrete depiction of this process for those who embrace a Pagan, Wiccan or earth-centered path in the children's book Shanna and the Raven, which is an adventure story linked to the February 2 festival of Imbolc. The book follows a ten-year-old girl through experiences of both perceived and real danger and shows how her mother helps her to use both physical measures and ritual to empower her, connect with intuition and obtain safety. There are serious themes in this book but children love it for the story and don't realize it means to "teach" something and that alone makes the concepts much easier to absorb. I often hear parents say that they don't allow their children to participate in their spiritual path until they are teenagers. And this perplexes me. Certainly, there are practices that are beyond the capabilities of children and children shouldn't be forced into a straight-jacket of specific beliefs. However, there are many simple practices, rituals and traditions that can give children protection that truly soothes fears rather than simply suppressing them. And the successful use of such means will inevitably give children a greater overall sense of security and confidence. I wrote Shanna and the Raven as the first book in the Children's Wheel of the Year series precisely because I see these needs in my own children. And I hope they may help others as much as they have brought comfort to my family. What are your experiences with unexplained fears, the need for protection and using spiritual means to banish anxiety? Drop a line in the comments section below and join the discussion. You're invited to join my hearth-side email circle, an intimate group of readers with whom I share a kind of virtual cup of tea and links to my latest writing. As a new subscriber, you can choose one of the ebooks under the Books by the Fire tab and receive it free in your email inbox. Watch this space for instructions on how to get your free ebook after you subscribe. To get your free ebook, choose from among the books under the Books by the Fire tab at the top of the page. Then send me an email via the contact page and let me know which book you choose, your favorite ebook format (kindle, pdf or epub for tablets and ipads) and your email address.